A Jack, or more accurately, a Tyrolin of all trades. Broken Dolls, the first in the trilogy, is an international #1 bestseller and appeared on Buzzfeed’s Top 24 Best SciFi/Fantasy Books of 2015. Tyrolin has been in the Top 25 of the Australian Songwriters Association and Top 5 of the Australian Independent Music Awards, was awarded an Australia Day Award for Music in 2014 and 2017, and for Arts in 2015. She owns a performing arts school, teaches creative writing and co-hosts a podcast called HooPod, which is part of Felicia Day’s Hooman community. Despite this, chocolate, cats and copious amounts of TV marathons take up the majority of Tyrolin’s time. Colt Harper: Esteemed Vampire Cat by Tyrolin Puxty is a stunning fantasy novel about a vampire cat named Colt. A vampire cat always feels the need to avenge cats who have been treated badly. Colt has possessed a human named Sean for two years. But, one day, he decides to avenge a dead cat, which sparks a whole new adventure. Colt is forced into community service at a theatre with a nervous werewolf and a tickle monster that tickles people to death. And the body Colt inhabits yearns to regain control, forcing Colt out. And even worse, Colt finds himself falling in love with a human girl named Saffy. But that isn't all. Saffy's sister, Brynn, is a chaser; she kills monsters. And it just so happens, Saffy is part vampire cat. The two vampire cats, tickle monster, and werewolf run away, but there is more danger to come. Will Colt be able to survive? 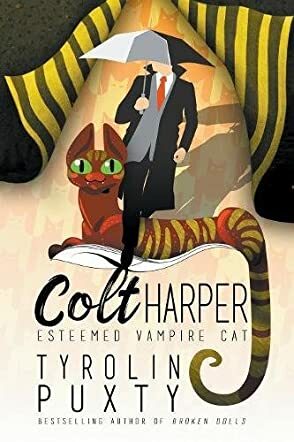 I really enjoyed reading Colt Harper: Esteemed Vampire Cat by Tyrolin Puxty. The book is very well written and descriptive. The story consists of many funny parts that made me laugh out loud. I liked that the book was written from Colt's perspective, because he has a funny outlook on things. The story has many suspenseful scenes, as well as scenes filled with action. The book had many plot twists that made me gasp aloud. I was hooked by the first page, because this is a real page turner, and will keep the reader on the edge of their seat. The characters are all very likeable, because they are brave, and show that anyone can change. I can't wait to read the next book in the series. The author clearly put a lot of time into developing the story. I would definitely recommend this book to everyone.